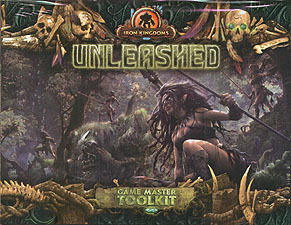 Equip yourself for adventure with the Iron Kingdoms Unleashed Game Master Toolkit, an essential set of resources designed to enhance your Unleashed Game Master experience. This toolkit includes a four-panel Game Master screen made from high-quality hardcover stock - big enough to conceal your core rules book, notes, and secret dice rolls yet sized for unobstructed access to the player area beyond. Featuring full-colour art on the player side and frequently used tables and charts on the Game Master side, this screen is perfect for keeping your head in the game and out of the rulebook. The set of five reusable dry-erase initiative cards easily tracks the order of initiative for player characters and NPCs alike, while the five dry-erase life spiral cards make it simple to track damage and healing. Also included are four full-colour, double-sided map tiles to help you build an incredible array of encounters and an all-new 16-page adventure set in the wild world of Iron Kingdoms Unleashed.